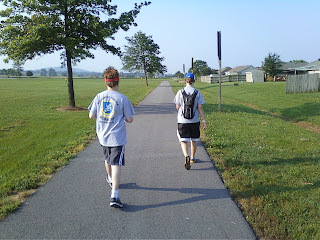 We enjoyed our first day out of school with a morning walk to the local park, around the walking trail, then back home. Retha & Cali (the dog) went along with us. Stephanie walked Cali almost the whole walk & they both enjoyed it. We are really lucky & have not one park, but two in walking distance from our house. I'll admit we don't enjoy them as much as we should.